You are here: Home » I’m a cactus, get me out of here! Although I like unusual plants and include variegated plants in the garden some plants are a bit too weird or ‘messed about with’ to find a place in my heart. But even so I have a go at growing them if they are popular so I know what they do and how to look after them. So this post is about a plant I really am not keen on. In fact I feel very sorry for it because it is a plant that cannot look after itself and has to be nursed throughout its whole life. I tend to like plants that can take care of themselves, especially if they sting or have spines and that same philosophy is why I like cats and would rather have one than a Yorkshire terrier (my apologies if you have one but I like the way cats are cute but can take care of themselves – in every way!). So the moon cactus or Hibotan is a poor little wretch. These forms of the perfectly normal Gymnocalycium mihanovichii var. friedrichii lack chlorophyll, the green pigment and would die if they were not grafted onto a green stock, in this case hylocereus. There are forms that are red or orange and yellow and you also often see a yellow form of the peanut cactus (Echinopsis chamaecereus). There is a rumour that these forms were produced by exposure to radiation but I cannot confirm this and it seems that they were natural seedlings that would have died if they had not been grafted. In any case they are very weird. They need normal cactus treatment, that is moderate water and feeding in summer and dryness in winter and good light at all times. Gymnocalyciums (chin cacti) are all small, globular cacti from South America and they tend to need higher temperatures than many others and most need a minimum in winter of 8c. 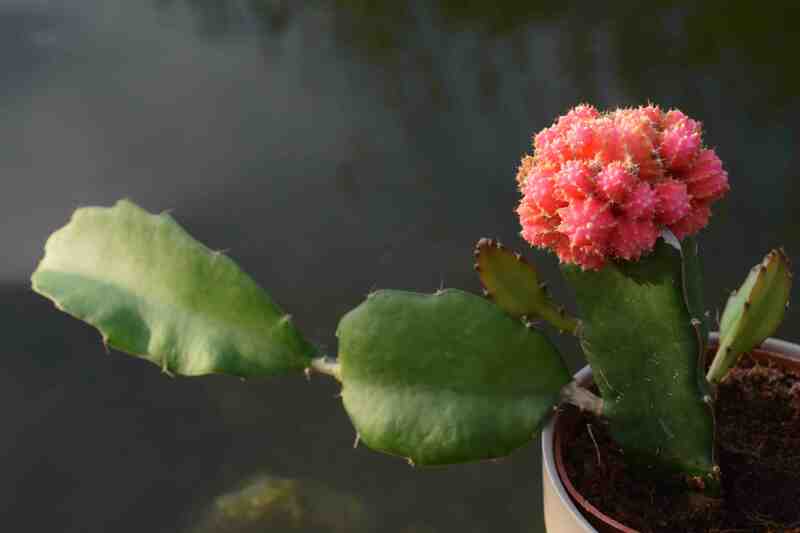 The Moon cactus is showy but is unlikely to produce the typical pink or white flowers of the genus and is not long lived. This is because it produces offsets and these get crowded and die, although you could remove them and graft new plants. There is also some incompatibility between the two cacti as the hylocereus will grow more vigorously than the moon cactus and push it off. The other big problem is when the hylocereus has had enough of being put upon and make a dash for freedom, as mine has done. I need to remove these stems or, like a green shoot on a variegated plant, it will grow at the expense of the bit you really want. I didn’t cut the shoots off the green part of the cactus and the top part dwindled away. I do not mourn its passing. I have a post on this subject. In the state of Florida in the U.S., they manage to sell very small kinds with grafts that bloom simply beautifully. Nevertheless, they are grafts that lack the chlorophyll (mutants) as you say, and will soon fall off as the main cactus will expel them as they grow. They are also called “Lollypops” as some of them look like a round ball. I think they do it for kicks, although I saw some grafts yielding very pretty flowers. Why do they bloom being just mutant grafts, don’t ask me. I think it might have to do with some mutant developed in a lab or something like that. Cacti have been grafted for a long time, often to allow tricky species to be grown more easily. There is no reason really why the ‘coloured’ gymnocalyciums would not flower if they were treated well and were growing strongly – it would be interesting to see the flowers – i must treat mine better. Here’s a link of the post. This blooming happened in July, in the state of Florida. Florida has this humidity I think they love.